The Hotel Cola , 3 stars of Bellaria, is characterized by its position, directly on the beach. It has parking and WI-FI throughout the entire hotel, rooms with balconies overlooking the sea and air conditioning. Breakfast is served buffet style and - for lunch and dinner - meat and fish dishes are prepared. No pets allowed. Hotel Cola boasts a privileged location: directly on the beach, in a side street of the Alfredo Panzini seafront. Here we are in the heart of Bellaria, with a high concentration of clubs, shops, games for children, leisure attractions and much more. Nearby is the Isola dei Platani, a well-known pedestrian area, ideal for pleasant walks or cycling. The rooms are equipped with balcony, air conditioning / heating, satellite TV 32 "Samsung, safe, WI-FI 200Mbps, bathroom with shower and hairdryer. LIGHT ECONOMY: attic room ideal for a couple, with a small balcony with access from the low side. COMFORT: ideal for families with children and couples. Here the balcony has a sea view. FRONTEMENT: the room is characterized by the presence of a large balcony overlooking the sea, equipped with table and chairs. The property has a garden, open-air porch, terrace with sunbathing area and views of the beach, lift, reading room, bar, TV room and free bicycles. BREAKFAST: sweet and savory, it is served buffet style with pastries, baked goods, cheeses, cold cuts and hot and cold drinks such as juices, milk, fruit juices, coffee and cappuccino coffee beans and fresh milk. PRANO E CENA: multi-choice menu with meat and fish dishes cooked according to tradition. 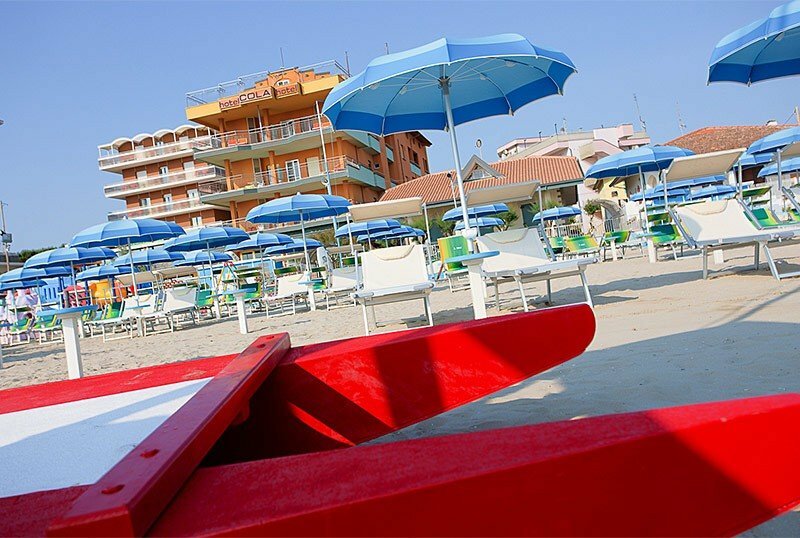 Being directly on the beach, the hotel is conveniently affiliated with the bathing establishment in front (Bagno Gino), which offers services for both adults (bars and small catering, sunbeds and beach umbrella) and for children (playground area and entertainment). Book and save by the end of May 2019 in the Bellaria hotel by the sea. Economy room ideal for couples and for those seeking the utmost tranquility but does not have special needs for space in the room. Without giving up the small luxury of spending holidays in a hotel directly on the beach. Contact us, only a few rooms! Book and save for June 2019 in a hotel on the sea Bellaria. Book and save for July 2019 at the Bellaria hotel by the sea. Book and save for July and beginning of August 2019 in a hotel on the sea Bellaria.